New Formula 1 World Champion acknowledges the Power of the Mind. | Alan Heary BSc. New Formula 1 World Champion acknowledges the Power of the Mind. Nico Rosberg was crowned the new Formula 1 World Champion last Sunday. The German beat Mercedes team-mate, long-time rival, and three time world champion, Lewis Hamilton by five points to clinch the title in Abu Dhabi. Karting is the entry level of motor-racing, and yet, Rosberg was not too proud to get back to basics. Just like Andy Murray would not question Ivan Lendl (his coach) if he told him to practice the backhand, we must be grounded and practice the brilliant basics. 2. Dealing with Pressure: Rosberg won the Japanese GP to open up a 33-point lead, setting up a scenario where he only required three second places and a third in the last four races to win the title. “The childhood dream is massive, it can weigh on you if you think too much about it and the desire when you get closer and closer is huge”. The German stuck to a race-by-race approach to ensure that the pressure was off him. 3. Stay in the moment: Nico says that the Japanese Grand Prix was a turning point for him, when he had 33 point lead – so instead of trying to win, the championship was actually his to loose. That is when the pressure really started. Nico’s approach was to stay in the moment as much as possible. “It’s a challenge, and of course I’ve learned to get through that. The mind is a huge part of the sport. I found my way during the season, in the early part actually, to remain in the moment and not think about the big picture”. 4. Teamwork is all: “No matter how good a driver you are, you have to have the right car and the right team behind you in order to succeed”. 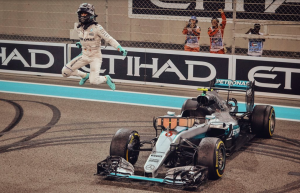 Rosberg was in the best team, but he marshalled his resources correctly, took his chances and made it happen – against a teammate who was arguably faster and more intimidating. Let’s all try and take these insights and inspiration forward as we put our sporting plans in place for 2017. ← Why should people do endurance racing?